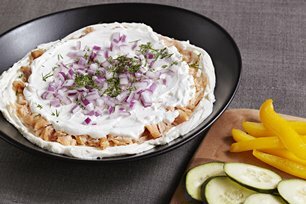 Smoked salmon, dill and red onions pack a lot of flavour in this creamy no-bake dip. Perfect for a brunch buffet! Spread cream cheese onto bottom of 9-inch pie plate. This great-tasting dip is sure to be a welcome addition to any brunch buffet. Serve it with assorted fresh veggie dippers or crisp crackers.